What began as a half-cocked effort to feed 125 residents of a nearby tent city has blossomed into a monthly community celebration providing a restaurant-quality meal to 450 people at seven shelters throughout Seattle. This week, I threw a few more questions at him. Q: First you gave Seattle a restaurant named for the orphanage in John Irving’s “The Cider House Rules,” providing “a place where orphans come to find a sense of home and family.” Next — saints preserve us! — you made it your mission to help the homeless. What do you recall about preparing that first meal for tent city when it was located at St. Therese Catholic Church? A: I spent most of the day thinking, “This is really exciting!” And then, “What was I thinking?! I have pork and chicken breast ready — and no idea what’s going to happen. I don’t know who’s coming, what they’ll bring, what we’ll make and how we’ll get it done in time.” And that’s exactly as it is now. Q: These days, you and your crew prep, cook and deliver the food by midday, but for your debut dinner, you also helped serve. What surprised you most about meeting — and feeding — the homeless? A: This was a population with many different cultures, and for them, home cooking meant so much more than mac ‘n’ cheese. My naive assumption was that they wanted to eat bland and boring food, but the big seller was gailan [Chinese broccoli] with Sriracha sauce. Q: Financially and emotionally, we’re living in a time that’s difficult for many. How’s that affecting what you’re doing at St. Clouds? Q: Thanks to the largesse of kind sponsors and private donors, you’ve got expenses for quality meat, poultry or seafood covered. Otherwise, you rely mainly on volunteers to provide additional ingredients. So, you’re just winging it, like those reality-TV chefs? Q: You’re proud of saying, “We’re providing an hour of dignity and good food to people who find too little of both in their lives.” But you’re maxed-out on the number of shelters you can help support. Besides donating time and/or money to local social-service agencies, what other ideas do you have for lending a hand to feed the homeless? A: I’d like to see other restaurants doing this, and I’d be happy to throw in my time to help show them how to get the volunteers to come in, get the donations, hook up with a shelter and get the work done — and cleaned up — in time for their restaurant to get restored for business. There are so many restaurants sitting dark every morning. I know it’s a huge strain for a restaurant owner or manager to take this on, but I see it as a way to do a lot of good in the world, and do yourself some good. I wouldn’t lie and say it doesn’t do anything for us. We have people who come here to eat and support St. Clouds because we do this. 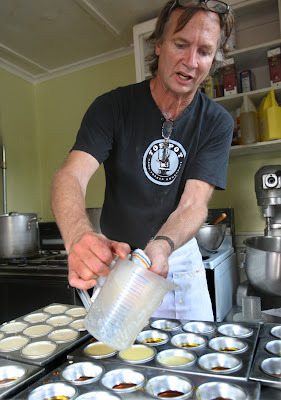 John Platt, seen pouring custard for flan at St. Clouds [Seattle Times/Jim Bates]. Co-owner Pablo Butler stakes out the dish-pit on “Homeless Cooking” Wednesdays, when he’s not balancing salt-and-pepper shakers or greeting patrons at St. Clouds.